BIG Members will now be able to receive double the rewards, earning BIG Points and redeeming their favourite everyday deals using BIG Points while enjoying savings up to 95% off on the best travel and lifestyle deals by Fave. BIG Deals by Fave allows over 3.6 million BIG Members in Malaysia to earn 1 BIG Point for every RM1 spent on lifestyle vouchers every day. We can also utilize our BIG Points to redeem BIG Deals vouchers, from food, beauty and activities to automobile services, travel and fitness, with popular brands like A&W, Healthland, Forever 21, Le Meridien Kuala Lumpur, Kenny Rogers Roasters and more offering discounts of up to 95% at over 3,700 outlets. With this new partnership, AirAsia BIG Loyalty is extending the privilege to BIG Members in Malaysia, as part of its commitment to giving members more freedom to enjoy bigger experiences at better value. Download the AirAsia BIG Loyalty app and sign up as a BIG Member today to start shopping on BIG Deals and earn BIG Points! Redeem flights to more than 130 AirAsia destinations plus BIG Deals vouchers, keep track of your BIG Member account, BIG Points balance and stay updated on the latest news and promotions, all on the AirAsia BIG Loyalty app. Alternatively, download Fave today and start saving instantly through amazing deals across multiple categories such as F&B, travel, beauty, activities and many others. Both BIG Loyalty and Fave apps are available on Google Play and the App Store. As a Fave users, we are able to reap new rewards. 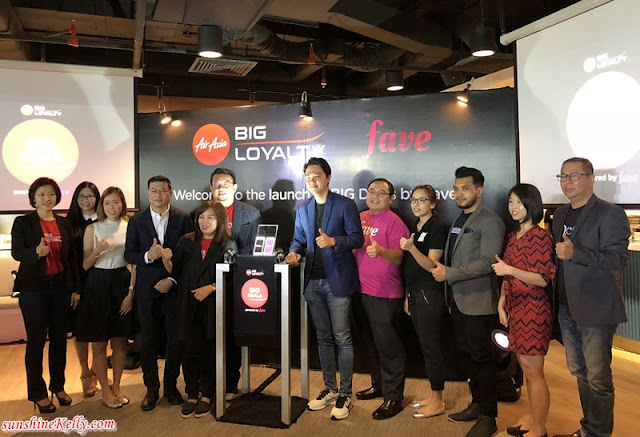 AirAsia BIG Loyalty opens the door for more than 3 million Fave Malaysia users to start enjoying BIG Member privileges and seeing the world even faster. By signing up and linking their BIG Member account to their Fave account before shopping, they will be able to earn 1 BIG Point for every RM1 they spend on Fave, which can be used to redeem AirAsia flights to amazing holidays across more than 130 destinations. This move is part of a continuous effort to reward BIG Members every say. In November, AirAsia BIG Loyalty launched its eStore, which allows BIG Members in Malaysia, Thailand, Indonesia, Singapore and the Philippines to shop from over 160 lifestyle and travel partners all on one platform - airasiabig.com. A seamless shopping experience with carefully selected brands like Uniqlo, Hotels.com and more, eStore rewards BIG Members with a faster way to earn BIG Points and gave them an easier, more convenient way to shop. It is good way to get the point after shopping and you can buy some more things with those point.